Anniversaries are a very important milestone in a couple’s lives together. Not only are they a wonderful day to reminisce on all the good times that have been had, they are a great occasion to celebrate an ever-growing love! If you have friends who are approaching an anniversary, don’t miss the chance to let them know how much you appreciate them and are wishing them well on their special day together. We’ve compiled a list of anniversary wishes perfect to share with your friends on their joyous occasion. Make sure that your friends know you truly appreciate them and will continue wishing the best for their love in the years to come! These wishes are perfect for that special couple in your life whose love truly serves as an inspiration to all around them. Reserve these wishes for close friends whose relationship you find awe-inspiring and wonderful. Happy anniversary to one of the most inspirational couples I know! Cheers to another year of smiles, hugs, and love. I am so in awe of the love you share for one another and I am so lucky to know both of you both as individuals and as a couple. Happy anniversary. The best things in life are better together and both of you have found the best person to share life with! Happy anniversary and congratulations. Congratulations to a wonderful couple on your many years of happiness together and best of wishes for many more. It’s not often that you see a couple who compliment each other perfectly, but you two are one such couple. Congratulations and happy anniversary. Best of anniversary wishes to two people that deserve all the stars, the sun, and the moon. May your love only grow stronger. Love is the champagne of life and the two of you have found the sweetest of it all. Happy anniversary, you two! A successful relationships requires falling in love over and over, recovering from every stumble, and continuing to grow. Congratulations on exceeding all expectations and growing together. Happy anniversary! It doesn’t matter where the journey is headed, but who it is travelled with and each of you have a wonderful travel partner. Happy anniversary. Happy anniversary and well wishes to two people who continue proving that love is well within reach and well worth the fight. These wishes are perfect for friends who have a huge sense of humor and will really appreciate a laugh on their big day. You’ll want to make sure the happy couple does know you’re only joking to avoid any hard feelings! I’ve heard it said that love is a battlefield, but a long-lasting relationship can be a war! Congratulations on surviving and growing stronger together. Happy anniversary! Congrats on putting up with one another for so long, I don’t know how both of you did it! Happy anniversary and here’s hoping you continue to deal with each other! Today is all about love… but let’s not forget all the kicking, fighting, and screaming that it took to get here! Happy anniversary, you two. I ask this because you are both my friends: how the hell have you managed to do it? All kidding aside, congratulations on your anniversary and here’s to you! The two of you are like the imperfect puzzle pieces that never seem to fit in… until you’ve found one another. Happy anniversary, weirdos! I can’t imagine where the two of you would be without one another… probably dead or living on a street corner somewhere. Congratulations on finding one another and happy anniversary. Congrats on having a relationship that can withstand the stinkiest of socks! Happy anniversary. Happy anniversary to two of the oddest, silliest, funniest people I know. It was lucky you managed to find one another! I was going to get you an anniversary card, but instead consider this a sympathy card for all you’ve endured from the other over your time together. Misery does love its company! Happy anniversary. 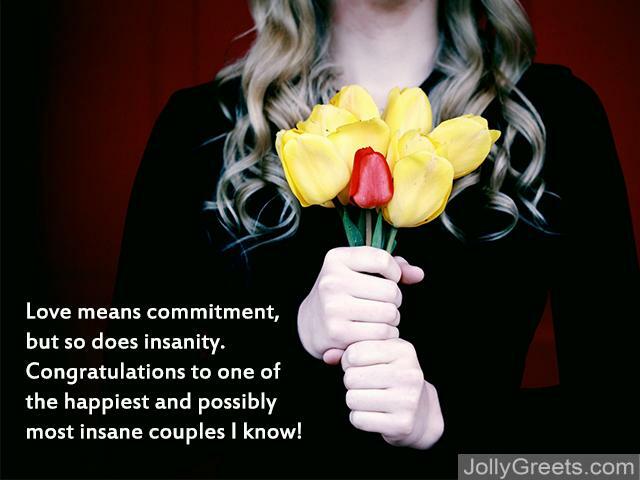 Love means commitment, but so does insanity. Congratulations to one of the happiest and possibly most insane couples I know! If you aren’t as close to one member of a couple or you have new friends celebrating an anniversary, these wishes are the perfect amount of heartfelt and respectful. Feel free to use these for couples who may also be friends-of-friends. Anniversaries are a time to celebrate all of the happy memories together. I hope the two of you have plenty of time to celebrate today. I wish you another year of happiness as you continue in your lives together. Happy anniversary. 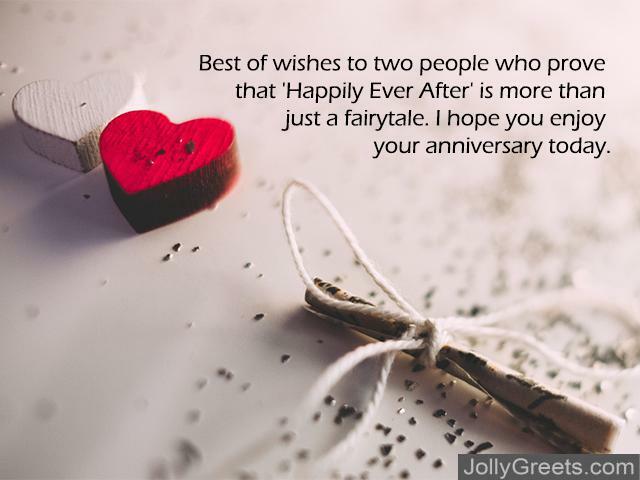 Best of wishes to two people who prove that ‘Happily Ever After’ is more than just a fairytale. I hope you enjoy your anniversary today. Wishing you all the best as you celebrate another year spent at each other’s sides. Happy anniversary. Happy anniversary! May your love continue to grow and your happiness continue to thrive. Happy anniversary to the two of you. May your commitment to one another continue to spread the joys of love to all who know you. Every year spent together is wonderful and unique, so remember to celebrate in your upcoming year together. Happy anniversary. 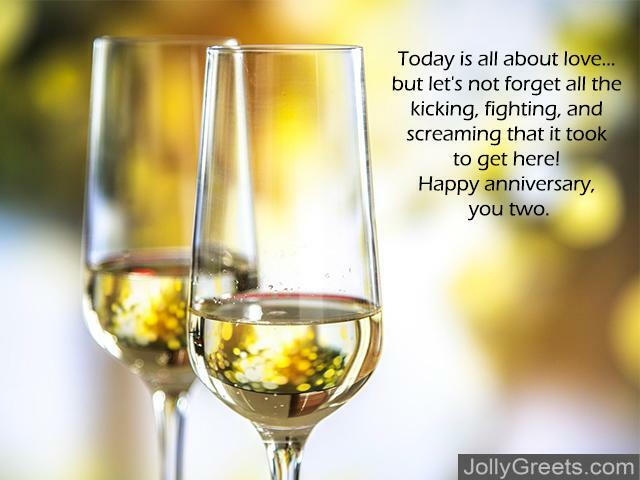 Congratulations on your anniversary and cheers to another year spent in love, in laughter, and in friendship. It seems that a life spent together agrees with both of you and I’m thrilled you are so happy together! Congratulations and happy anniversary. Anniversaries are a celebration of love, trust, partnership, tolerance, joy, companionship, and dedication. Congratulations on another year together. Hopefully one of the wishes we listed above is perfect for that special couple of friends in your life. Best of wishes to them and remember to remind them how special a day this is! Celebrating anniversaries with your partner are wonderful and it’s even more wonderful to share that joy with your friends. Knowing that people support and love both of you is a precious gift. Happy anniversary to your friends and may they continue living their best lives together!